Bladerunner Soundtrack (25th Anniversary Edition) by Vangelis: It contains unheard music from the movie and an extra disc with new tracks inspired by the movie. Electronic music at its best! Interstellar Soundtrack by Hans Zimmer: Hans writes songs like no one else. Intense and full of dramatic elements still containing melodies of an incomparable elegance. Interstellar goes far beyond the concept of a soundtrack, it´s almost a confession of faith - made with music. 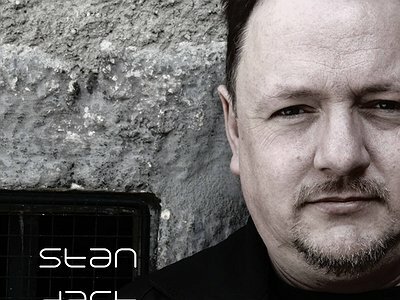 Website / Contact: If you enjoyed this interview with Richard Hasiba aka Stan Dart, visit his website to listen to extracts from his albums and order his music directly from him. When I was a teenager, I worked with a Yamaha Keyboard and made my first attempts to record my own tracks on tape, influenced by the music at this time (Jan Hammer, Paul Hardcastle, New Order, Vangelis, Depeche Mode and all the shimmering bands of the 80ies). It was the electronic sound that fascinated me from the beginning. A lot of tapes later (including many “strange” attempts to create mixtapes too), I felt that the technological progress wasn´t ready for me to use it. Instead, I started to listen to music in a very intense way, spending a lot of money to collect all kinds of 12inch vinyls and records/CDs of my favourite artists. I never intended to copy the style of an artist, as this wouldn´t create something new. Sounding like someone else is nice, but there´s already someone with this style. So what sense would it make to copy that sound? Nobody would care. I listened to a lot of music in the 80ies – pop, easy listening, electronic music and soundtracks, and I think the way Vangelis uses the technology was teaching me involuntarily the way I use sounds these days. His combination of electronic and classic elements was groundbreaking for me. Still, “Chariots of fire” & “Bladerunner are one of the best examples of soundtracks made with electronic instruments. Also, listening to Jan Hammer´s music for “Miami Vice” influenced me a lot. It was there that I realised how important it is to create a solid and simple rhythm as a base for a good song. Therefore, I played a lot of the hits from that time at home, to discover HOW they were made, WHAT their secret was and WHICH instruments made them sound so magically (which was hard to discover in times when there was no Internet). Those attempts never reached the public, as they were only my way to understand electronic music. But later on – and that sounds a bit paradoxical – I wrote some cover versions too! I´m great fan of German artist Schiller, and it was my intention to re-create some of his songs in my own way (as I never had the chance to get some stems from him for remixing). Writing these covers taught me a lot about the structure of songs: How to start, which effects are suitable, how to use these effects in an economical way in order to prevent distraction from the message of the song … All these experiences helped me to create my style - my musical identity. I started with an old Windows XP PC with less hardware resources. I worked in my bed room (at times of day, where everybody else was already “offline”) . To write a track I had to be very patient. 10 Stems for a project – that´s all that PC could handle. I had to export the stems into a wave file – open a new project – import the wave and add some 9 other stems, and so on … so it took a while back then to finish a track. I think every musician is constantly looking for new tools to enhance his way of creating music. I prefer using virtual synthesizers (they sound fine and don´t equire a place to set up) but also, I love my Roland for its warm preset sounds which can be adapted quite easily. It´s hard for me to tell which of my tools I prefer most. Alchemy (which is now only available for Mac Users) is a fantastic tool too, which I use in nearly every production. But to be honest Samplitude is my most important software. No other DAW is so flexible when it comes to create a “home” for your track . Also, they provide a lot of highend plugins. I tried Ableton, Reaper and FL and went back to Samplitude! A machine is only as good as the people creating and using them in order to full fill a certain goal. Working with synthesizers and computers doesn´t mean that these machines write the songs; they only produce a sound. It´s the human who picks up these sounds and creates something out of it. The result will be different depending on his sklls. But in the end it is the human not the machine who wrote the track. A well programmed algorithm of a plugin can help you to create the desired sound. It can support you on your way and best programmed tools (hard- and software) can inspire you and raise your production to a level which you never thought being able to reach (I think this is a basic principle which can be used for every field of technology). The idea for a song is still coming from my mind, influenced by story, a picture, a song, a book, a movie or whatever. When the idea is strong enough (some disappear within a few moments and can´t be held until I enter my studio), I mainly start with a piano sound, to write down the idea of the melody. A piano is a very pure and unique sound to me and most of the time the best way to start a track. In the end it doesn´t have to be a piano sound – it could turn out, that a guitar or distorted, phased synth-sound fits the original idea better. But these changes happen at a certain time almost automatically: It´s the song which tells me how to go on. Yeah, I know that sounds strange, but it´s the best way to explain what I call the “pure flow” effect when working on tracks. There´s only one limitation I maintain: After 3 days of working on a track with no results or the chance to see a structure ahead, I delete the whole project and start again. "There´s only one limitation I maintain: After 3 days of working on a track with no results or the chance to see a structure ahead, I delete the whole project and start again."